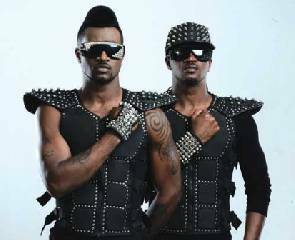 Peter and Paul Okoye of Psquare, winners of the Special recognition award at the just concluded Headies awards, which was held at the Eko hotel and suites, Lagos have revealed how it took them years to save their first million naira. Just before they were given their awards, the twin brothers who wowed the audience with a rendition of their old tracks, at the annual music and video awards, revealed the other side of them that fans did not know. “While we were living in Jos, we lived with our uncle and he gave us – Jude, Paul and Peter just one room to share. It wasn’t easy, we were squatting with a large family. “Somehow, we came to Lagos and after selling our stuffs, we were able to rent a one-room apartment and you know we had no chairs but we did not care. All we were after was how to market our music…..eventually money started coming in but it was small, very small. For a while, we were angry that our names were being mentioned everywhere and peeps would see us to say, ‘I just saw your music on MTV base”, meanwhile we had no TV to even watch the MTV base in our house”. On their first one million naira, they said “The first time we had one million naira we celebrated it. For a long while, all we could save was N850,000 and it was paining us. One day however, we went for a concert and right there we were paid N150,000, then it was big money. We immediately added it to the N850,000 and voila, we had N1million. We bought drinks to celebrate, we were glad that we were now millionaires”. “To the upcoming artiste, you don’t make money immediately, it’s like you are investing in music and would reap later on”.